From Contrarian Outlook: If you’re looking for tax-free yields, municipal (“muni”) bonds can provide you with 5%+ distributions that Uncle Sam won’t touch. With rates rising, it is a bit tricky to make savvy buying decisions at the moment. But income investors buying smartly today are banking 5%+ yields – and paying as little as 88 cents on the dollar! I do regularly hear from readers who want more muni ideas. But you know me: why would we discuss an investment unless it’s a bargain? Well today, certain muni vehicles are cheap (details on which ones shortly). Plus demand for these tax-free bonds is outpacing their supply this summer. Nuveen reports there are only $56 billion in new muni issuances from June through August. Meanwhile, expiring munis are spinning off an extra $95 billion looking to be reinvested. interest rate advantage over U.S. Treasuries. The margin is as thin as it’s been in years. And it’s a valid concern for those who don’t know how to buy the right muni bonds. But investors who do know munis are banking 5%+ tax-free yields today. And some are even securing big margins of safety to boot! How? Simply by selecting the best muni closed-end funds (CEFs). Buying a CEF is even easier than buying individual muni bonds. We simply enter the ticker in an online brokerage account, click the “Buy” button and we’ve got a fund with a handpicked portfolio of 900+ muni bonds (and monthly distributions to follow). Our tax-free distributions get even better when we buy at a discount. Because CEFs each have a fixed share count, they can trade above and below their net asset values (NAVs). An 8% discount, for example, means we’re buying $1 worth of munis for just $0.92. It also means that we receive more yield. For example, Nuveen’s AMT-Free Municipal Credit Income Fund (NVG)pays a 4.9% distribution on its NAV. But investors who buy shares today will actually earn 5.3% on their investment (thanks to its 8% discount). The fund’s 8% discount is potential upside for us if and when this window closes. Not interested in selling for upside? That’s fine – buy these funds at a discount anyway to protect your downside risk. And since I know most of my readers are buy and hold income investors, let me give you five muni funds that are bargains today. All five pay 5% or more, are exempt from Federal taxes and trade for a 6% to 12% discount to the value of their underlying bond portfolios. These funds have also been excellent long-term investments. This is important because, in my experience, past performance is the best indicator of future results in CEF-land. This is especially the case for munis, where the best managers consistently deliver “alpha” thanks to their unfair advantages (connections and capital) in this less-than-efficient corner of the market. 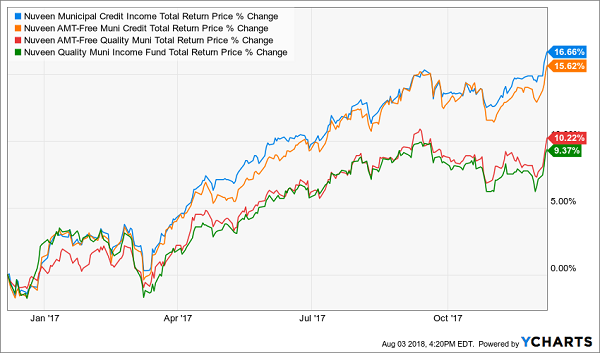 Each of the funds above have returned 6% or better on their portfolios since inception, which means the managers are well connected and that they know what they’re doing. They are also poised to outperform their historical norms, thanks to the generous discounts they trade at today. And while I like these muni names today, I actually LOVE another group of monthly dividend payers even more. These cash cows are setup to continue dishing out secure 8%+ yearly payouts with double-digit price potential to boot. My “8% Monthly Payer Portfolio” focuses on the best monthly dividend buys at any given moment. As you can see, the yield alone makes this strategy quite compelling – if you’re interested in retiring and making a living on your dividends alone. The best part is you won’t have to go back to “lumpy” quarterly payouts to do it! Of the 19 income studs in this unique portfolio, 12 pay dividends monthly, so you can look forward to the steady drip of $3,333 in income, month in and month out–give or take a couple hundred bucks! Now, many retirement experts pitch real estate as the best way to bank monthly income. But this grandma isn’t hustling to collect rent checks or fix broken light bulbs. She’s simply collecting her “dividend pension” every month, which is 100% funded by her stocks and funds. Actually her monthly salary is more than 100% financed – which is why her portfolio has grown by $10,000 even though she’s withdrawn $3,000 per month. The iShares National Muni Bond ETF (MUB) was unchanged in premarket trading Friday. Year-to-date, MUB has declined -1.09%, versus a 7.25% rise in the benchmark S&P 500 index during the same period. MUB currently has an ETF Daily News SMART Grade of A (Strong Buy), and is ranked #1 of 40 ETFs in the Municipal Bonds ETFs category.